GIS and Data Program Manager David Will outlines the challenges posed by conservation data collection and calls for innovative solutions to expediate this crucial component of preventing extinctions. Imagine you are on a remote island fighting your way through thick bushes in search of footprints the size of quarter – but hoping you don’t find any. This might sound like fun for a weekend but imagine your job for two years is to look hard—for nothing. 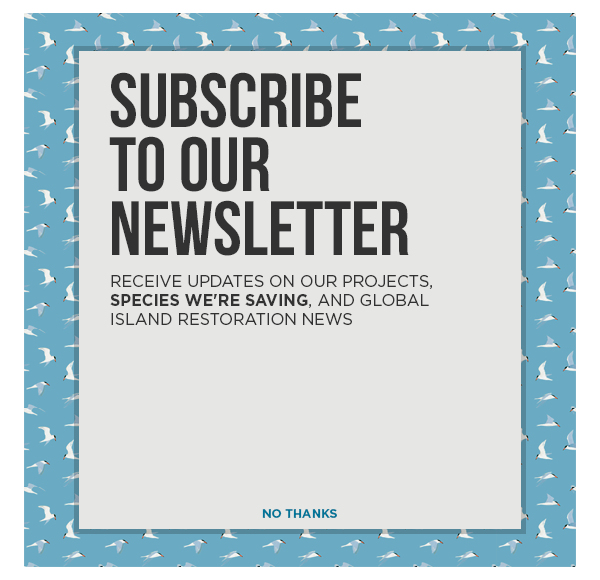 This is the task undertaken by some of the world’s leading conservationists working to protect unique island species from the threat of introduced, damaging (invasive) vertebrates on islands. Invasive vertebrate species on islands are a primary driver of extinction of island species, but this threat can be addressed by removing (eradicating) the invasive species. To ensure the invasive species does not repopulate the island, we must be certain that every last one has been removed. This week for National Invasive Species Awareness Week, Island Conservation, the National Invasive Species Council, and Conservation X Labs are posing a challenging aimed to generate innovative ideas that can support the task of confirming zero. We need the help of gurus, hobbyists, and dreamers to accurately detect invasive species at low densities and confirm that the last one has been removed from an island. Confirming zero—being certain that no invasive species are left on an island, is hard work. Conservationists search thousands of kilometers and sort through hundreds of thousands of photos, which can take months, or even years. Tools like monitoring cameras, track-pads (flat surfaces like sand that capture footprints), and drones are effective at detecting invasive vertebrates, but are limited by our ability to retrieve and analyze detection data – especially on remote islands without internet access. Innovative solutions that automatically identify species and deliver detection data could save conservationists countless hours and result in the preservation of unique species for future generations. To learn more about this challenge visit the Conservation X website. We look forward to hearing your innovative ideas.